In 2009, Cincinnati native, artist Jeremy Flick, received his Masters of Fine Art Degree in Painting from the University of Maryland College Park. His artwork has been featured in solo and group exhibitions across Maryland, Ohio, New Mexico, Texas, Minnesota, Indiana, Kentucky and Denmark. He is the recipient of numerous honors, including, 1st Prize in the 2008 Sadat Art Peace Competition and the David C. Driskell Award of Excellence from the University of Maryland. His work will be included in Academy 2009, 9th Annual Survey of MFA/BFA Work, at Conner Contemporary Art in Washington D.C., opening Saturday, August 1, 2009, from 6:00-8:00 pm. Jeremy currently lives and works in Washington, DC. Jeremy's art combines an exhaustive conceptual search with a controlled formal approach, resulting in a cohesive, consistent body of work worthy of closer examination. Recently, we talked to Jeremy regarding his work, his thoughts and approach to making art. 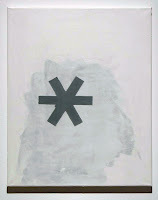 Contemporary Art Review: In these paintings, you employ and manipulate specific shapes appropriated from the security patterns in hundreds of different envelopes. What initially sparked this investigation? Jeremy Flick: As a visual person, I am always looking at things, I guess, looking for things that can find their way into my work; and my works tend to be referential of those things that I am looking towards at the time, so that there has always been a relationship between my investigations and my production. CAR: Have you used this rigorous data collecting process towards different subjects for previous bodies of work? How do you find the right balance between investigation and production? JF: In my work, I am interested in ideas, not simply the visual experience. There is a lot of thought and research that goes into the works. I guess I become satisfied with a work when it finds that balance between the visual and the idea. CAR: Viewed at a distance, your paintings are largely solid white grounds populated by sparse groupings of rigid, geometric lines. When viewed at close range, these tight lines reveal loose brushwork and playful spontaneity. The white grounds reveal hidden layers, accidental drips, textural variance, and subtle tonal range. Why do you preserve the hand’s evidence, rather than simply using stencils over clean white surfaces? JF: I preserve the history because it’s there and should be shown. The paintings are more than they first appear to be. The patterns I am dealing with in these paintings, are taken from the patterns inside security envelopes which are mechanically printed and are not pure. On closer inspection, the nature of their production leads to numerous deficiencies in the printed patterns, so I wanted the paintings to address those same ideas of accidents and the deficiencies. CAR: So the accidental printing defects in the envelopes' patterns are comparable to the natural variances in the handmade marks? CAR: The visual impact of your individual paintings differs from the large installations, not only in terms of size, but also in movement. 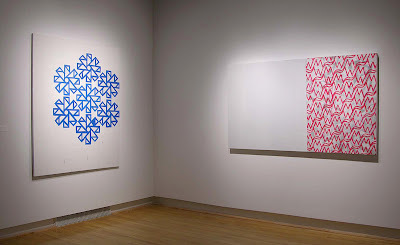 The installations’ repeated segments lead the eye in several directions, while the paintings create a more meditative mood. What ideas connect your paintings and installations? 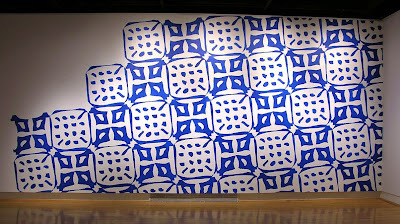 JF: I wanted there to be a dialogue between the two types of works and the way that they can inform each other as different ways to experience the patterns. 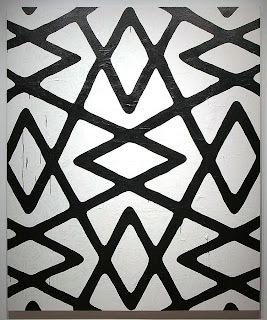 I utilize the same symbol of the star shape in Modus Operandi as I do in Snowflakes Make the Sidewalk Softer; but the reading and the experience of the symbol is different in each specific work, and I am interested in that interplay. Paintings on canvas have a tendency to be read in a specific way. I look at the installations as paintings; but, because they don’t happen to be presented in the ways paintings are traditionally shown, they take on a different kind of reading and meaning. CAR: Your large installation, Snowflakes Make the Sidewalk Softer, generates its illusion using a repeated symbol, similarly derived from envelope security patterns. How should one reconcile your use of identical forms, originally intended to preserve anonymity, to represent an object renowned for its individuality? JF: I see the question as answering the very question it asks. The title Snowflakes Make the Sidewalk Softer is taken from a line in the song, The Fastest Year, by Gerritt Reeves, who is a good friend of mine. I just loved the poetic allusion the lyric made. 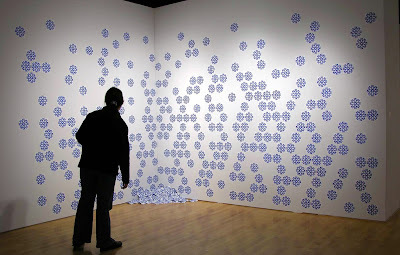 In the installation, I thought it would be interesting to re-represent the pattern in such a way as to engage that interplay of originality and anonymity. To learn more about Jeremy Flick’s art and progress, visit his website at www.jeremyflick.com. Thank you for reading; and thank you, Jeremy, for your participation.